If you wish to be listed, please write us. To fight against junk mail, replace @ by # . 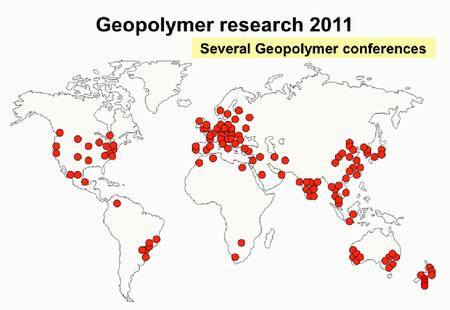 Geopolymers and Advanced Materials Engineering Research for Sustainability (GAMERS) Laboratory. Head, Waste and Chemicals Management Unit of Center for Engineering and Sustainable Development Research (CESDR), Team leader, GAMERS Lab. De La Salle University, 2401 Taft Ave., Manila, 0922, Philippines. International Airport, Atlantic City , NJ 08405, U.S.A.
Geopolymer’ 99 International Conference, 1st July 1999, at Saint-Quentin, France. Ing. Jean-Jacques Legrand, a pioneer from 1972 to 1982. Dr. Richard Lyon (F.A.A. ), for his excellent scientific articles in 1996-1998. Ing. Michel Davidovics and Ing. Bruno Martin (Géopolymère S.A.), for their developments of carbon/geopolymer composites. Prof. Guy Demortier (Namur University), for its perseverance and support in archaelogical reasearch since 1984. Chemist Nicolas Davidovits (right) for his involvement in geopolymer manufacture since 1979. World Congress Geopolymer 2005, 30th June 2005, at Saint-Quentin, France. Dr. Gilles Hug for his scientific analysis work in archaeology. 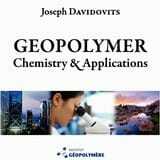 Dr. Roman Slavik for his work in geopolymer chemistry. Prof. Vijaya Rangan for his extensive civil engineering studies with geopolymer cement. Dr. Grant Lukey (together with Prof. Jannie van Deventer) for their comprenhensive studies in geopolymer chemistry for 10 years.